Is Sylvan Court the tiniest alley in Manhattan? 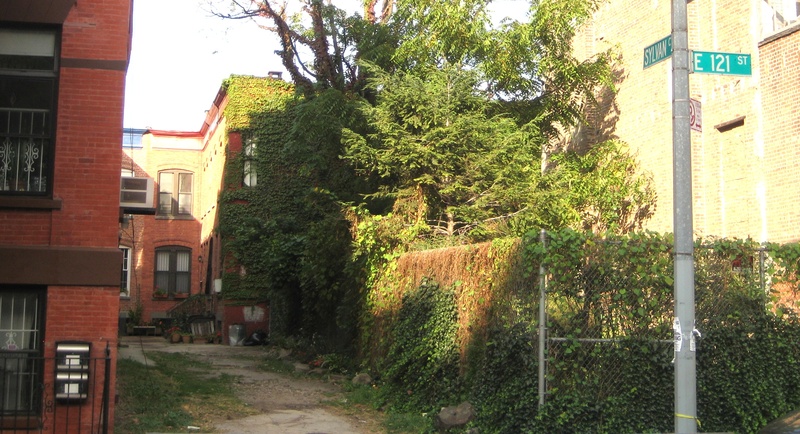 Unpaved and demapped, little Sylvan Court is a half-block blind alley off 121st Street between Lexington and Third Avenues. It’s an extension of equally obscure Sylvan Place, which runs from 120th to 121st. The two-story houses on Sylvan Court were probably used as stables in the late 1800s, when Harlem was more of a sleepy village than the expansive urban neighborhood it would become by the early 20th century. The homes aren’t in the greatest shape; the alleys of the West Village and Brooklyn Heights feature similar carriage houses that have been lovingly restored, not left to the elements. But they sure are charming. 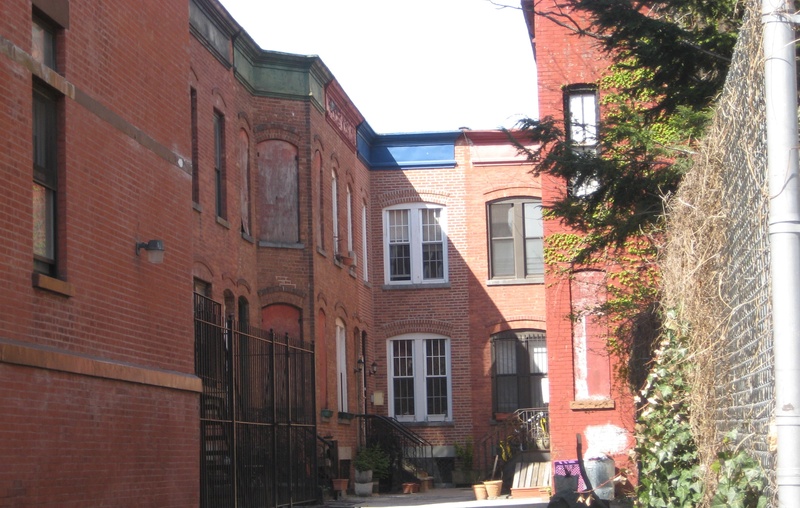 Unlike other alleys and mews in the five boroughs, they don’t have landmark protection. Sylvan Court shouldn’t be confused with Sylvan Terrace—a better-restored mews dozens of blocks northwest. This entry was posted on October 10, 2009 at 10:56 pm and is filed under Upper Manhattan, Urban beauty. You can follow any responses to this entry through the RSS 2.0 feed. You can leave a response, or trackback from your own site. I have a recurring dream about a closed courtyard, that looks like this one with houses on three sides and where I ran in but now is blocked that I dare not turn around to look at what’s blocking my passage. All I keep doing is go to each doorway as I struggle to get ‘in’ or ‘out’…Yet in my dream there are more houses. Very weird, I think…Wonderful that this is Manhattan, at least I feel at home there. Wow Cano this is jose mikey’s brother we lived at 5 Sylvans place across from the park. I married Edwin Santiago whose family lived in 2 Sylvan Court for years. His parents moved out and moved to Taino Towers on 122nd Street. And, I lived at 2 Sylvan Court with my family. I believed I lived there for about 5-6 years…the house did not have any heat and was pretty much unlivable! There was also no electricity. The house has an interesting background. The house was once rented by Santeros who practiced ritualistic killings of chickens in the basement. The house was extremely haunted when I lived there. While I lived I received a letter stating the houses were considered landmarks and would be restored. I am astounded at the pics of the property now! Just gorgeous!